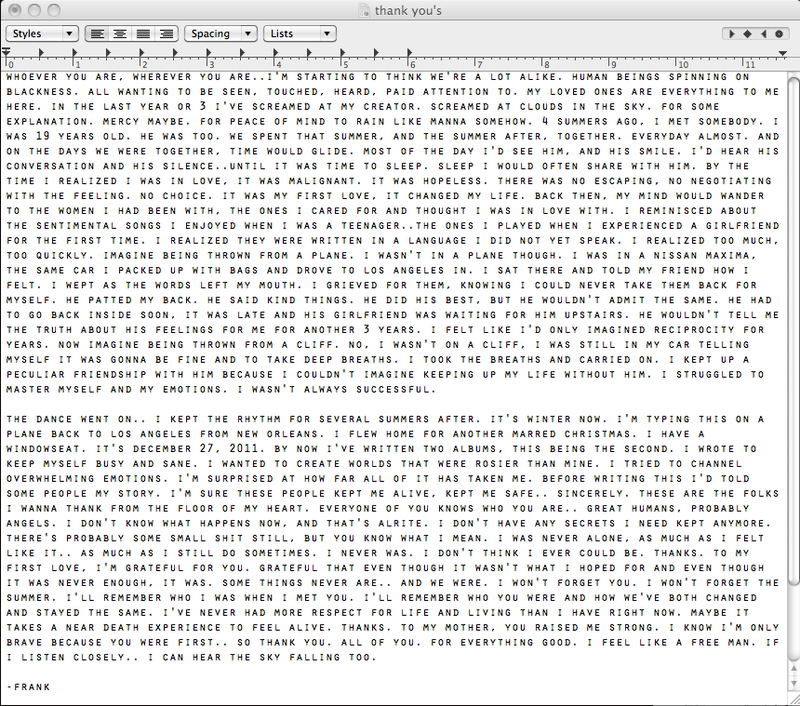 Best TV 2012: Frank Ocean on Late Night. Late Night With Jimmy Fallon: Frank Ocean’s début. NBC, July 9, 1:30 a.m.
A year ago, soul singer Frank Ocean was just the guy who guested on Watch the Throne. Sure, Odd Future fans and R&B nerds had been all over the 25-year-old for years, but when I wrote about his coming out in July, many commenters wondered whether he really deserved the coverage. A week later, he had the No. 2 album in the country, selling 131,000 copies in its first week. Last week he tied Jay-Z and Kanye West with a leading six Grammy nominations, including record of the year, album of the year, and best new artist. Why? To a surprising degree it’s because of a single TV performance given in the wee hours of the morning—and replayed over and over again online. Late Night With Jimmy Fallon has become known for snagging artist debuts and featuring the best musical performances on late night, but with Frank Ocean and “Bad Religion,” they pulled off the year’s most unforgettable. There’s no denying that the moment was, in part, about Ocean’s sexuality. For his debut, just one week after he made his headline-making announcement on Tumblr, and on the same night that his album went on sale, Ocean chose to perform his most confessional song. “Bad Religion” finds Ocean paying a cabdriver so that he can open up about his unrequited love for another man. After a church organ intro, Ocean tells the driver he’s “got three lives”; “I can’t tell you the truth about my disguise/ I can’t trust no one.” If that sounds like it’s about the same “first love” Ocean described in his open letter the week before, well, that’s because it is—Ocean confirmed it at a show a few weeks later. But as Ocean’s Fallon performance went on, it became about more than first love. Decked out in red, white, and blue, Ocean sang in front of the Roots and a small orchestra, but it’s his talent that took center stage. Ocean’s vocals dipped and circled around the melody line with the casual mastery of a soul veteran, and the more he slipped into his falsetto—he held back at first, building tension—the more you could feel the pain contained in the song no matter who you were. In this way, what made Ocean’s performance great wasn’t just its confessional nature, but Ocean’s professionalism. The young artist even stuck around after the show to help perfect the sound mix before broadcast. What you heard was the sound of Ocean transforming from guest on Watch the Throne to first out-of-the-closet R&B star to, maybe, artist of the year.